윤명숙, 이묘숙,(2011).지역사회 여성노인들의 우울과 생활만족도에 관한 연구.한국지역사회복지학,36(),89-115. 본 연구는 지역사회에 거주하는 여성노인의 우울과 생활만족도의 관계에 있어서 자아존중감의 매개효과를 검증하기 위해 실시하였다. 전라북도에 거주하는 65세 이상 여성노인들 229명을 대상으로 AMOS 18.0을 이용하여 분석하였다. 연구결과 첫째, 여성노인의 우울에 건강상태, 연령, 배우자 유무가 영향을 미치는 것으로 나타났다. 둘째, 여성노인의 자아존중감에는 거주 지역, 건강상태, 경제상태, 배우자 유무, 자원봉사가 영향을 미치는 것으로 나타났다. 셋째, 여성노인의 생활만족도에는 건강상태, 경제상태, 종교 활동이 영향을 미치는 것으로 나타났다. 넷째, 여성노인의 우울이 생활만족도에 미치는 영향에서 자아존중감이 완전매개효과를 가지는 것으로 나타났다. 이와 같은 연구결과를 바탕으로 지역사회 여성노인의 자아존중감과 생활만족도를 높이기 위한 지역사회 복지프로그램 개발의 필요성을 제언하였다. The aim of this study was to examine the mediating effect of self-esteem on the relationship between the level of depression and life satisfaction of elderly women. 229 elders participated as the subjects of the study who were above 65 years old women in Jeollabuk Do. Structural Equation Modeling in AMOS 18.0 was adopted to examine measurement model and mediating effects of self-esteem by using Bootstrapping method. The partial and full mediation model were compared and x² difference test was conducted between the two models. The analysis resulted confined the full mediation effects of self-esteem in the relations between the level of depression and satisfaction of elderly women. 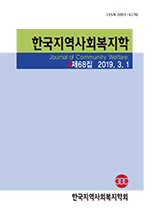 Based on these findings suggested that social work intervention service should be discussed to reduce the level of depression and increase the level of self-esteem for life satisfaction among elderly women.